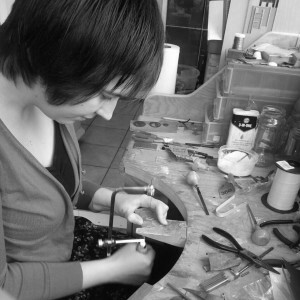 Charlotte graduated from Sheffield Hallam University in 2010 with a Ba (Hons) in Metalwork and Jewellery. In 2012 Charlotte discovered enamel and fell in love with the fascinating range of effects enamel can achieve. Since then all of her work has included some aspect of this. Charlotte is currently studying for her MA in Jewellery, Silversmithing and Related Products at Birmingham’s School of Jewellery. Through material experimentation my work aims to explore texture and pattern. In some pieces enamels are layered up and then laser engraved to reveal details below the final surface. The glossy top layers contrast with the almost sugar-like etched areas providing both tactile and visual interest. In other work I explore the luminosity of transparent enamels over hand engraved surfaces. Excellent craftsmanship is very important to me and underpins everything I try to do. I use a combination of traditional and new CAD/CAM processes to produce my work and am always keen to try new things with enamel. My current work is inspired by the patterns formed by pylons, telephone wires and scaffolding which are seen every day and yet are largely unnoticed. By bringing these patterns into focus in items of jewellery and silverware I want to highlight and share the beauty I see in them and perhaps encourage others to look more closely at the mundane.